Beyerdynamic T1 review | What Hi-Fi? There are two parts to this review: here we have Beyerdynamic's T1 headphones, which need to be paired with the company's A1 headphone amplifier. This pairing represents great value. No, we haven't taken leave of our senses – we know that spending near £1900 on headphones and partnering amplifier is a touch extreme – but let us explain. If you want to hear every last nuance of sound from a recording, we haven't come across a better way of doing it than this Beyerdynamic combination. Certainly, no sub-£20,000 amp and speaker pairing we've heard has got anywhere near unravelling a complex recording like Radiohead's In Rainbows as well as this duo. That's before you consider the limitations any normal room places on performance. Every instrumental thread of 15 Step is scrubbed clean, and remains easy to track regardless of how complex the rest of the production gets. Each note is defined: the ability to stop and start really has few rivals in the speaker world, regardless of cost. All that detail combines to produce an addictive, harshness-free whole that'll see you revisiting every corner of your music library. Over-played albums such as The Dark Knight OST and Kanyé West's 808s & Heartbreak sound fresh again, and have us listening to the end. Timing and dynamics are as good as the price suggests, though Beyerdynamic's sound is more about control and precision than excitement. There's no attempt to liven-up a recording: you get whatever's on the disc, that's it. But with a charging track – say, Florence and the Machine's You Got the Love – the A1/T1 pair delivers the full dose of energy. The T1 deliver far more bass than any sub-£1000 headphones we've heard. The A1 mirrors this achievement, making even top-class (if cheaper) amps from Chord and Lehmann sound insubstantial in comparison. Comfort and build-quality levels are high; the T1s strike a fine balance with well-padded ear cups and headband. 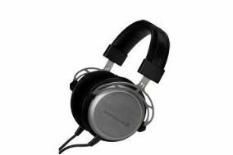 But there are still the unavoidable limitations of conventional headphones (at any price). The stereo image is stuck in the middle of your head, and there's little of the sense of scale speakers offer. Also, don't skimp on the source or cables, or you'll never hear the A1/T1 combo at its best. A £1500 CD player or DAC equivalent is the bare minimum. Match well and you'll know how your music really sounds – like it or not!